An app's home page can feature many different kinds of information. You can display a report of your application data, including a chart or timeline. Add a fully formatted text section, complete with links, fonts, and images. 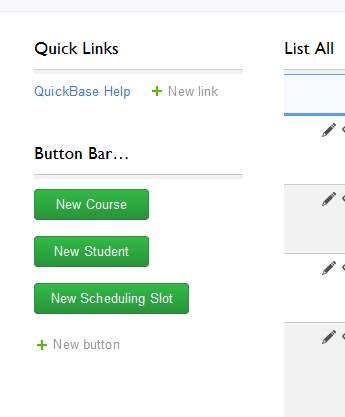 Add buttons and links to allow users to perform actions such as adding new records. Include a search file to help your users find the data they need. You can even embed external web pages. Each type of information lives in its own section, called a widget. You can include as many as widgets on the home page as you like (and up to nine of them can be reports). Creating and embedding a report that shows the current user's open tasks or upcoming appointments is a terrific customization that delivers exactly those records that users want to see when they first open your application. To do so, create a new report. In the Filters section, select a User field (like "Assigned to") and in the next dropdown, select Is current user. Save this report, then drag it and drop it onto on your app's Home page. Each person who opens your application will see a highly personalized and relevant Home page. If users will be accessing the application on mobile devices, read tips for creating mobile-friendly application Home pages. Let people know where they are and what they're looking at. In the Page Name box, type a descriptive title for the page like "Customer Projects Dashboard" or "Wires and Gears Sales App Home." The Home Page icon ( ) appears if this app home page is the default home page for your user group. To save changes to the Page Name, click Save in the Page bar. The heading will appear at the left side of the Page bar. Next to the Page Name field, you’ll see a row of buttons representing the different widgets that you can use on your app Home page. This is the Widget Gallery. To add a widget to your app Home page, simply drag it from the Widget Gallery onto the app Home page. As you drag the widget around the app Home page, you’ll see green guidelines appear on the page to indicate where the widget would appear if you dropped it, and a popup bubble describes what will happen in that case. While dragging the widget, hover over different areas of the app Home page to find the position you want. When you’ve decided on the perfect location, drop the widget. A Settings dialog for the widget will automatically pop up. This dialog can also be accessed by clicking the Settings icon ( ) of the widget. You may place a widget almost anywhere on the page, in any row, in any order. You can also stack widgets in the sidebar. Note: Reports may not be placed in the sidebar. All widgets automatically adjust to fit the width of your browser window, minus the width of the sidebar (if any). When you place a widget in a row by itself, it will expand to fill the row. Thus, the width of the widget is the width of the row. If you place another widget in the same row, the two widgets will automatically share the row width equally. You may change the size of these widgets by dragging the divider between them. The widgets will snap to one-third the row width, one-half the row width, or two-thirds the row width. If you place another widget in the row, such that there are three widgets on a single row, their width may not be changed. They are fixed to one-third of the row width each. To increase the width of the widget, remove one or two other widgets from the row, or move the widget to a different row. Widgets placed in the sidebar automatically take the width of the sidebar. You may stack as many widgets in the sidebar as you like. For most widgets, the height of the widget is determined by its contents and automatically sized to fit. However, you can change the height of Report or Chart, Reports List, and Web Page widgets. To change the height of one of these widgets, hover over the widget until you see the resize bar at the bottom edge of the widget. If you place the mouse cursor over that edge, it will change to indicate that you can drag the edge up or down. As you drag the widget’s bottom edge down, Quick Base will track the height of the widget in pixels for you. Note that changing the height of the widget also changes the available space for other widgets in the same row. Any widget can be customized to be collapsible, if it is the only widget in its row. This option may be selected in the Settings dialog ( ). A widget that can be collapsed will show a collapse icon ( ) next to its title. To move an existing widget, hover over its title bar. The cursor will change to a move cursor ( ). Drag the widget to its new location. To customize a widget, just click the Settings icon ( ) on the widget. The Settings dialog for that widget type will open. Any widget can be customized to include a title. To show a title for the widget, select this option in the Settings dialog. To change the title of any widget, double-click the title. Alternatively, hover over the title bar. The Edit icon ( ), will appear to the right of the title. Click the Edit icon. The title will become a field that you can use to change the widget title. Enter the new title, then Enter or click the Save icon ( ) next to the title field to save your changes. If the widget is a Report or Chart widget, you may wish to match the title of the widget to the title of the report. Click the Revert icon ( ) in the far right corner of the Title field to do this. To delete a widget from the app Home page, hover over the upper right corner of the widget. A Delete icon ( ) and a Settings icon ( ) will appear. Click the Delete icon. A dialog box will pop up, asking you to confirm that you want to delete the widget. Click Delete to remove the widget. Any customization such as titles. You will not lose any data. All text and images in the widget. We recommend that you copy and paste into a rich text editor to save this information before you delete the widget. Any customization of the buttons. Any customization of the links. Just the URL. No scripting is allowed for this widget. Note: Deleting a widget may affect the presentation of the widgets around it. If the deleted widget was on a row with one or two other widgets, those widgets will change size to fill the row. At any time, you can cancel your changes and revert to the most recently saved version of the app Home page. Click the Cancel button on the app Home page’s title bar. To save your changes, click Save on the Page bar.